Idaho Sportsman Lodge - Great fishing and hunting motel in Stites, Idaho! 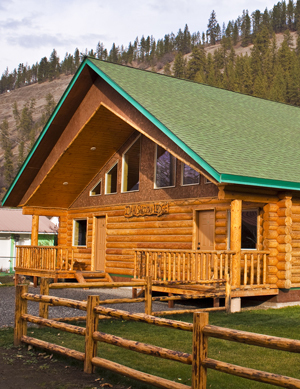 - Idaho Sportsman Lodge - Home comfort at motel prices! We are glad to have you chosen to learn more about our lodge and the beauty of the Clearwater Valley. To get started please watch our guided tour video and learn more about your opportunity below. Located just a stones throw away from the South fork of the majestic Clearwater River in Stites, the Idaho Sportsman Lodge is the destination for all of your outdoor adventures. Established in 2008, we are open year-round and offer several different lodging packages, depending on the size of your party. We offer 4 spacious units available to rent either nightly or weekly. Each unit is fully-furnished and accentuated by local artwork and hand-made furniture. Every unit is over 800 square feet and sleeps up to 8 people. You will relax and enjoy yourself within the comfort of spacious vaulted ceilings in the living room, a full-sized kitchen, a large bedroom and bathroom downstairs, as well as a loft with its own bathroom and several beds. Click here for our photo gallery. Whether you are here for the great attractions like big game-fishing; hunting; whitewater rafting and kayaking on the Middle Fork, Selway, and Lochsa rivers; or even casting your own expedition in the country once traversed by Lewis and Clark; you will feel revitalized by the beauty of the Clearwater Valley and the luxury and comfort of the Idaho Sportsman Lodge. Reserve your next big adventure! Call us at 208.926.4766 and talk to us about the local atmosphere and countless activities personally or send us an e-mail.